What is average salary in Croatia? Based on our survey (390 individual salary profiles) average GROSS salary in Croatia is HRK 194,530. Average NET salary is HRK 122,455. The most frequent GROSS salary is HRK 94,950. The most frequent education is Masters Degree. The most frequent experience are 4-8 Years. Below is the list of 390 individual salary profiles - all added on this website. Bachelors Degree, 8-12 years: "business insurance"
Masters Degree, 2-4 years: "Power system analysis"
Bachelors Degree, 12-16 years: "Responsible for natural gas transport through national pipelines. Shift work, 12h shifts"
High School, 1-2 years: "Cook in a hotel"
Bellow H. School, 1-2 years: "sell insurance policies to customers"
Bachelors Degree, 16-20 years: "Support engineer working on Microsoft technologies." Bachelors Degree, 2-4 years: "Selling retail products"
Some College, 8-12 years: "Taking care of booking and issuing invoices, allocate costs"
Masters Degree, 8-12 years: "Control..design...manage..liaise"
Bachelors Degree, 12-16 years: "Worked in PWC, in RBA in risk management, Finance controller for past 12 years"
High School, 1-2 years: "Inbound calls for airlines"
Bachelors Degree, 12-16 years: "Lead multiple teams, coordinate between departments, line management"
Masters Degree, 12-16 years: "managing of sales and distribution and team"
Bachelors Degree, 12-16 years: "Software management and coordination"
Masters Degree, 8-12 years: "EHS Manager - health and safety"
Masters Degree, 8-12 years: "Credit approval, financial analysis"
Masters Degree, 8-12 years: "Regulatory affair specialist for local and EU banking related regulation working as EU SPOC - internal contact person for regulatory affairs, responsible for steering, coordination and monitoring of supervisory related activities with regards to EU legislation within the Bank Compliance officer for general compliance issues Specialist for FATCA and CRS regulation Compliance officer for capital markets (securities finance)"
Some College, 12-16 years: "Realisation of Company’s strategic plans and ensure achievement of business goals"
Masters Degree, 20+ years: "Teaching students"
Some College, 12-16 years: "managing office"
Bachelors Degree, 12-16 years: "Medical Sales development"
Bachelors Degree, 16-20 years: "Telecom - core network design consultant"
Masters Degree, 4-8 years: "cash flow, investments, budgeting"
Masters Degree, 8-12 years: "Corrosion Management Team Leader, Production Chemistry Team Leader, etc." Bachelors Degree, 12-16 years: "Developing firmware for microcontrollers"
Masters Degree, 2-4 years: "Assistant design engineer. Transportation infrastructure projects"
Doctorate Degree, 20+ years: "Teaching, mentoring students, project manager"
High School, 12-16 years: "Coordinating daily tasks for online advertising"
Masters Degree, 4-8 years: "Agile Project Manager"
Masters Degree, 4-8 years: "Dealing with digital agencies, making deals, running campaigns, reporting on campaigns"
Masters Degree, 8-12 years: "IAM Software Tester"
Some College, 8-12 years: "Working for local and global customers and companies, whole career experience in IT, in customer facing roles - Consistently exceed goals and customer expectations - IT administration, system engineering, IT projects, IT services - Strong technical background and understanding of core infrastructure technologies and services. - Efficiently communicate and negotiate with customers, various suppliers, external providers and in-house teams"
Bachelors Degree, 1-2 years: "Leading the project from start point to release. Communicating with clients." Bachelors Degree, 12-16 years: "Responsible for increasing revenue in specific region , incrinsing performance of partners from that region, techical support to partners, advise them how to increasing revenue and ne more competitive"
High School, 2-4 years: "vehicle battery system assembly"
Doctorate Degree, 4-8 years: "Software developing"
Masters Degree, 2-4 years: "project manager assistant"
Some College, 20+ years: "repair and maintain equipment, machinery, fabrication of replacement parts using machine tools , update CMMS, train new millwright apprentices, order critical spare parts list"
Bachelors Degree, 8-12 years: "I provide esl lessons to adult students"
Masters Degree, 20+ years: "Commercial credit Underwriter"
Some College, 0-1 year: "Selling, advising, cleaning"
Masters Degree, 0-1 year: "Administration work. Fill data in access or excel. Answering mails and phone queries." Bachelors Degree, 4-8 years: "plm developer unique job profile"
Masters Degree, 4-8 years: "Brand visibility, Public relations, crisis management, communications"
Masters Degree, 8-12 years: "Recruitment & Selection, Payroll, Pay & Rewards, Benefits, Work&Life Balance, Inclusion, Affirmative Action, Learning and Training Development Implementation, Coaching & Mentoring, Policy and Procedure writing and updating"
Bachelors Degree, 2-4 years: "PR & Digital Marketing Specialist for 3 years"
Masters Degree, 2-4 years: "I am a fitness coach and a professor of PE"
Bachelors Degree, 4-8 years: "project management junior level with french and english"
Masters Degree, 4-8 years: "Management of finances and human resorces"
High School, 2-4 years: "few years working as cook, had two seasons on summer in the island of hvar, and the rest of the work I did in Zagreb. overall 3 years of the experience"
Masters Degree, 2-4 years: "Managing portfolios of funds under management. Conducting portfolio risk returnd and preforming asset allocation." Masters Degree, 2-4 years: "corporate sales for corporate clients"
Masters Degree, 20+ years: "Performance of financial analyses, Impairment tests, Risks assessment, monitoring and reporting, Costing controls and analyses, Business projects modelling, Business planning and long-term financial planning, Tax planning for Controlled International Companies, Preparation of prices forecasts, Coordination of reporting to the Group Headquarters." Bachelors Degree, 12-16 years: "In charge of: warehouse, planning, sourcing, purchasing, facility management, logistics. Total of 90 people under management." Masters Degree, 4-8 years: "sales engineer prodajni inzenjer"
Masters Degree, 0-1 year: "I develop software for RNC, and in last position I started working on embedded things"
Bachelors Degree, 12-16 years: "In charge of: logistics, planning, warehouse, facility management and sourcing / responsible for EMEA region (europe, middle east & asia)"
Masters Degree, 12-16 years: "Overseeing the full recruitment cycle, in particular contract preparation. Providing specialist information and guidance to employees and managers on HR policy and practice and employment law. Promoting equality and diversity in the recruitment process. Ensuring that all company policies and procedures are up to date in line with current employment law. Ensuring that the correct recruitment and selection procedures are adhered to. Assisting with day-to-day HR related questions. Conducting interviews and reference checks on job applicants. Keeping up to date with legal developments. Developing HR policies. Planning, and delivering, training, including inductions for new staff. Controlling costs and ensuring that they do not exceed budgets." Masters Degree, 1-2 years: "Takong care of City green areas and botanical gardens"
Bachelors Degree, 20+ years: "owner and manager of a mixed use architectural firm"
Masters Degree, 2-4 years: "Project Management in Logistics"
Masters Degree, 12-16 years: "Working in compensation systems for HQ and all international subsidiaries"
Masters Degree, 2-4 years: "Drawing plans, goind on the construction site, making to estimate the value of real estate estate, coordination of paperwork and associates, fixing IT problems on PCs. In essence, everything possible for the profession was that part of the work of an architect or building engineer or real estate appraiser." Masters Degree, 16-20 years: "Innovation and efficiency improvement"
Masters Degree, 8-12 years: "DWH Team leader and coordinator"
Masters Degree, 12-16 years: "- managing projects - software desing - database da sign"
Bachelors Degree, 12-16 years: "Bartending, drink serving, waiting the tables"
Masters Degree, 8-12 years: "C++ and blueprint programming in Unreal Engine, game testing and debugging." Bachelors Degree, 8-12 years: "Software development, reserach"
Masters Degree, 16-20 years: "Business consultant in IT sectorr"
Masters Degree, 2-4 years: "Lead Software Engineer Lead Software Engineer"
Masters Degree, 4-8 years: "Sales coordinator for Adriatic region"
Masters Degree, 4-8 years: "Data center infrastructure engineer"
Page 1 of 4, 100 of 390 salary profiles. In spite of the slow recession recovery, Croatia is still ahead of some EU members such as Bulgaria, Romania, Poland, Latvia, and Lithuania. It's GDP per capita for year 2011 was around 64% of the EU average. Unemployment rate was 13.5% in March 2011. The country has experienced faster economic growth recently and has been preparing for the EU membership. Economy in the Croatia is mostly based on the services. Tertiary sector accounts around 70% of all GDP. 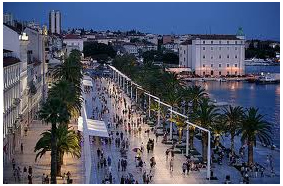 Tourism is very important industry in the Croatia, especially during the summer. It generates more than 7 billion EUR revenue per year.